Unique Solutions, Unrivaled Expertise. We understand that no two loading projects are alike. Given the range of products transferred between terminals and rail or road vehicles, some projects warrant a more custom solution. And no one has more experience than SafeRack when it comes to producing custom loading and unloading solutions. Our process begins and ends with you. Our team works with you every step of the way to design a system that’s both safe and effective. After taking flow rate, cost and other special requirements into consideration, our team will design and build a high-quality custom loading arm designed for hassle-free operation. And, as always, our solution will keep your surroundings—and employees—safe from harmful chemicals. You Get a Solution That Keeps Your Employees Safe and Your Business Productive. Valves can be located inboard or outboard to facilitate loading. And with a valve located outboard, dripping of viscous products after loading can be minimized. When equipped with additional swivel planes of rotation and/or drop hose, along with required outboard coupling, union or fitting, the single arm loader is adaptable to tight fill or closed loading. OPW Engineered Systems offers the world’s most complete line of Steam Jacketed Loading Arm solutions. All OPW Loading Arms can be fully or partially jacketed for efficient handling of asphalt, molten sulfer, waxes, resins and other products that are highly viscous or tend to solidify at ambient temperatures. All OPW Loading Arms can be outfitted with pneumatics to help make operations simpler, safer and more efficient. Pneumatically-actuated loading arms utilize air to counterbalance the arm and provide movement in a variety of planes. The loading arms can be outfitted with a single pneumatic cylinder for up-down movement or multiple units for the ultimate in effortless operation. OPW By-Pass Loading Arms are designed to be a low-cost alternative to arms constructed of Hastelloy, Alloy 20 and other specialty metals used to transfer hydrochloric acid and other corrosive chemicals. OPW Drum/Tote filling arms are ideal for loading all types of intermediate bulk containers (55 gallon drum and totes). The PTFE Lined Loading Arm is designed for the loading and unloading of acids and caustics. It has a long reach and is ideally suited for applications where the tanker connection flange cannot be positioned precisely. This loading arm works well with closed and open top loading/unloading of road and rail tankers with a flange connection or cone. Because of the swivels joints and balanced design, the loading arm can be handled with little effort. They had it on a truck right away and we had it the next day. We needed 2 parts. I contacted the rep at SafeRack. They had it on a truck right away and we had it the next day. Awesome! 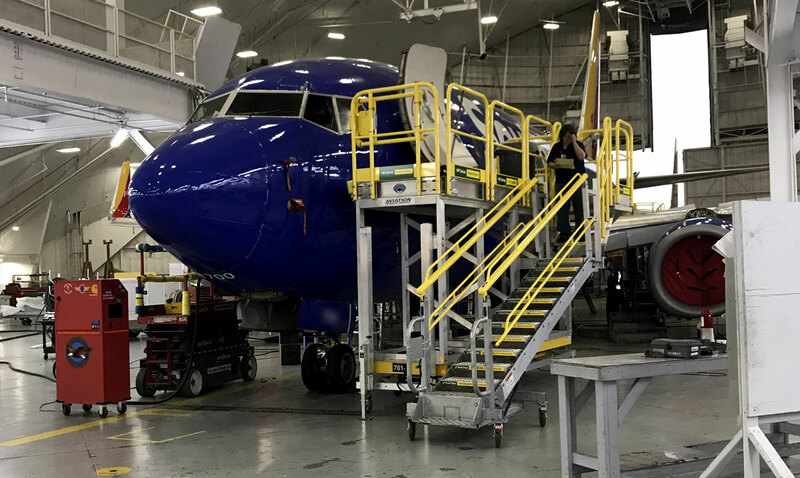 Jason Tyner and Katie Kelly were on it…These gangways take a lot of abuse and they are easy to operate.